There is a saying that the older you get, the faster time flies. I certainly feel as though I must be getting very old indeed with the way the past few weeks have flown by. As I write this, there are only four weeks until Christmas; yet it seems as though we were celebrating Christmas only a few months ago! The School has certainly been a busy place this term, with the many end of year events, graduation, student examinations and preparation for reports. As always, we have enjoyed the vibrancy that makes our school such a dynamic community. There are a number of important activities scheduled over the final weeks of the term. Students in Years 7 – 9 are eagerly anticipating the cross-curricular programme that has been developed for the remainder of the year. The programme is a rich learning task, allowing students to explore and consider some real life problem solving. The projects will be on display to parents, staff and students on Tuesday 7th December. Further details will be provided next week. Students in Years 10 and 11 will be undertaking an important review of their examinations next week, as well as a range of other important activities. After the exam review, Year 11 students will be attending Year 12 seminars where they will be presented with the course outlines for each subject they have selected, as well as holiday reading and preparation to assist with the very busy Year 12 schedule next year. It is imperative that students attend these seminars which will be of great benefit to their studies. The School has also booked in an excellent guest speaker to talk to the students about vision, resilience and creating habits. Year 10 students will be completing an Endorsed Programme which will give them credits towards their WACE graduation. This gives students a vital ‘buffer’ for the WACE in the event of any unexpected difficulties with any of their chosen courses. In addition, students will also be completing an accredited course in CPR, which is a valuable life skill. As with all schools, staff move on from time to time. At the end of this year we will be farewelling Mrs Gemma Colgan and Ms Clare McCall. We wish them both well in their future endeavours. Our annual Presentation Evening will take place on Monday 5th December at 6.30pm in the Perth Town Hall. All parents are invited to attend. This is the highlight of the year – an opportunity to recognise students for their academic achievements, effort and citizenship. We will be entertained by musical items and are delighted that the Lord Mayor, Ms Lisa Scaffidi, will be present to address the students and assist with the presentations. It is compulsory for all students to attend this evening. Students are able to remain at the School where they will be supervised by staff if required. Students are to wear their formal winter uniform for this event. Anglicare WA is a not for profit community service organisation, supporting people, families and their communities to cope with the challenges of life by building their resilience and capacity. Anglicare assists people with relationship issues, financial problems, and housing difficulties. Over the past year, Anglican schools in WA have raised $49,663.49 for Anglicare. I was delighted and very proud to see that St George’s is the fifth highest contributor out of all the Anglican schools in WA. Considering the size of our school, this is an outstanding result. Well done to our school community for their support of this agency. Although we have raised a significant amount of money through fundraising, we have contributed many hours of service to agencies that support those less fortunate. It is heartening to see the development of a sense of social conscience amongst our students. 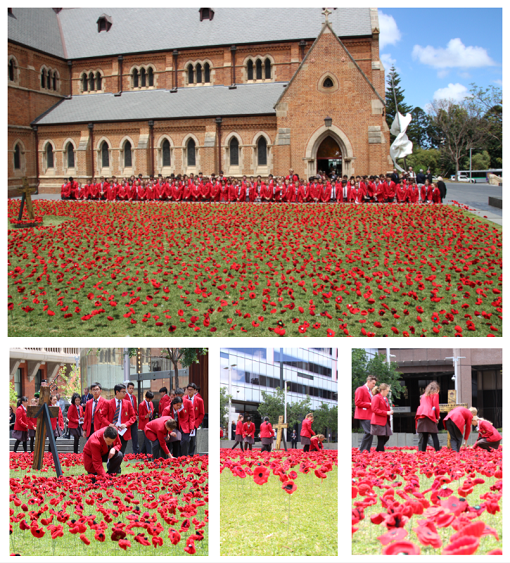 Our school community was very privileged to be able to participate in the Remembrance Day Service at St George’s Cathedral on 11 November. The service was conducted by The Very Reverend Richard Pengelley, Dean of Perth. Students form the School assisted with Bible readings, prayers and poetry readings as well as assisting in the carrying of the Villers-Bretonneux cross through the Service. The Villers-Brettoneux cross is a priceless relic of the First World War. The cross was made by men of the 51st Battallion on the battlefield in 1918. It is housed at St George’s Cathedral and serves as a poignant reminder of the sacrifice made by so many to protect our freedom. At the conclusion of the Service, all members of the congregation were able to ‘plant’ a hand-made poppy in Cathedral Square. These poppies ( more than 7000 in total) were all made by members of the Cathedral congregation, and made a stunning display. Our thanks to the Cathedral staff for inviting us to be part of this service. We are also very grateful to The Very Reverend Richard Pengelley for conducting all of our Chapel services while Father David has been on long service leave. Students are encouraged to attend the upcoming Year 7 – 9 social and Year 10/11 Dinner Dance. Further details will be provided to parents next week. I look forward to seeing parents at the Presentation Evening. We are pleased to announce the appointment of Mrs Angela Tanham as Senior School Coordinator effective 1 November 2016. Mrs Tanham is our current Head of House for Lincoln, Teacher Librarian and Accounting Teacher. 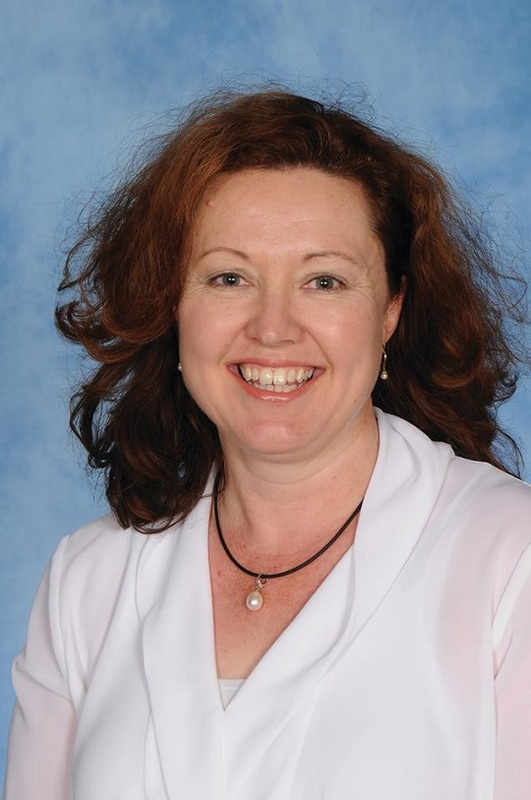 We look forward to Angela’s leadership and management within the Senior School. Wednesday 19 October marked the official opening of the 2016 St George’s Anglican Grammar School Art Exhibition. 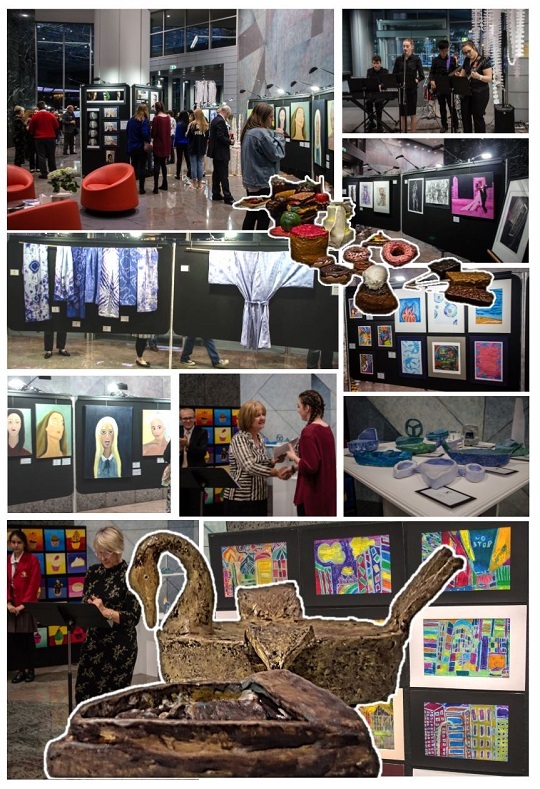 The collection, which was showcased in the foyer at Central Park, celebrated the excellent work of Visual Art and Design students from Years 7-12. The evening was well attended, with guests enjoying the delicious catering and ambiance of the venue, whilst viewing the incredible work on display. What a splendid day we enjoyed as we congratulated and farewelled the Class of 2016! Our graduating class started their day with a sumptuous breakfast in the Cafeteria. As tradition dictates, the students were entertained by the Heads of House reading out “It wouldn’t be Year 12 if…” – a personal memory for each of the students. 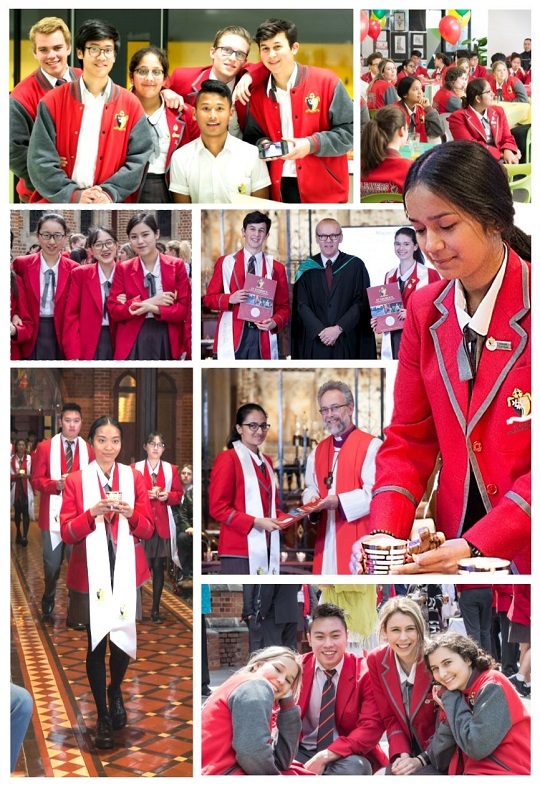 In the sacred space of our Chapel, the glorious St George’s Cathedral, the Year 12s had their final worship service with their parents, guardians and carers, followed by a morning tea. At the afternoon assembly the whole school had an opportunity to say goodbye to the Year 12s, who have been their big brothers and sisters of the St George’s family, providing mentorship and friendship. The Head Boy and Head Girl of 2016 and other members of the Guild had an opportunity to speak to the School. It was quite clear that this wonderful group of students feel a strong connection to the School. Their sincerity and gratitude shone through as they told of their enduring memories, relationships formed and what they valued about their alma mater. The Head Boy and Head Girl for 2017 addressed the Class of 2016, thanking them for their contribution to the School, and providing some wisdom for their future. In the evening, the formal Graduation Ceremony took place in the Cathedral where the awards were given out. Each Head of House then introduced their students, who were presented their Graduation Certificate by the Principal. Before Mrs Diggeden and the CEO of the ASC, The Revered Peter Lawrence, addressed the Class of 2016 with wise words, the Valedictorian, Khairyll (James) Hampson, spoke eloquently to his peers. The joyous occasion ended in Burt Hall with a lavish supper served by a group of dedicated Year 11 students and the Guild of 2017. 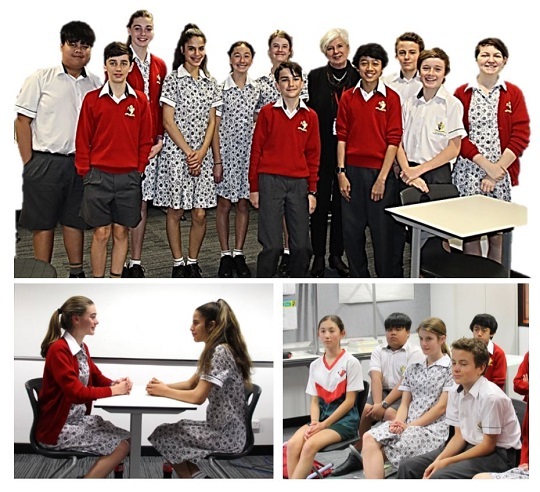 During week three this term, all Year 8 students completed a major speaking and listening assessment in their English classes before two adjudicators from ORACY Australia Inc. ORACY used to be known as the English Speaking Board and it offers certificates that rate oral proficiency against national accredited standards. As part of the Year 8 Assessment A programme, students had to complete (1) a 4 minute speech on an area of personal involvement then answer questions on their topic; (2) spend 2 minutes reading aloud from a favourite novel; (3) perform a memorised 2 minute oral interpretation of a poem, and (4) a listening component where students are expected to ask the presenter broad, open questions. I am pleased to report that all students were awarded a high certificate or above, with 39% of our students reaching the top “outstanding” level. These results are particularly impressive and are indicative of the effort our Year 8 cohort demonstrated throughout the process. Even more pleasingly, our students have further developed their confidence in public speaking and many of them commented on how much they had learnt through this challenging task. 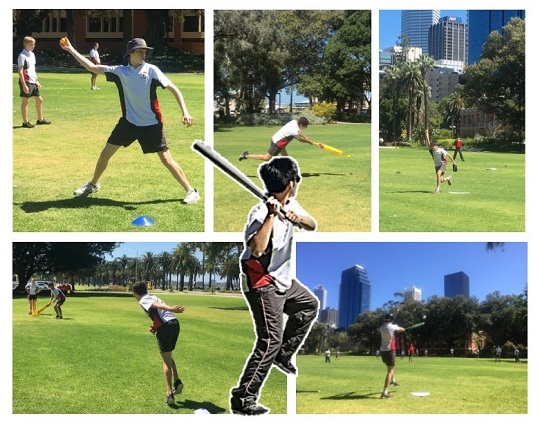 This term, we have played Softball and Cricket at Supreme Court Gardens. The fundamental movement skills focused on are throwing, catching and striking and object control skills with bats and gloves. Students improved their knowledge and understanding of the rules, strategies, techniques and terminology used in these sports. Perfect performance comes from on-going regular practice. Sports like softball are introduced for a period of four to five weeks during which all students achieve improvements. It is quite remarkable how many can now catch a ‘fly ball’, have learnt to hit a ball in the ‘strike zone’ and successfully apply skills in games which were of a great standard. This was only achievable by the students’ willingness to move out of their comfort zone and give it a go. I would like to thank all of the students of St George’s for their willingness to try, to put themselves out there, to know they may not be good at something but still be willing to attempt the skill or try the activity. It is a credit to each and every one of them! Well done students, it has been a fantastic year of sport, camaraderie and good fun learning and developing skills to enable participation in modified games! I encourage you to keep approaching sport knowing that if you never stop trying then you will succeed and improve. I would like to commend Mr Yousri Gharsallah who supports the Physical Education Programme. Yousri plays in Premier League Soccer here is Perth and is a talented Goal Keeper. He is working hard at building our soccer programme and is keen in building our junior inter-school soccer teams in 2017. Yousri has been a great role model and lots of fun for our students and I have appreciated his willingness to assist me in all that I do. Speaking of 2017: I have started getting together our School Swimming Team. I am excited to start the year with morning training sessions at Mercedes Swimming pool at 6am every Tuesday and Thursday. Our first session is on Tuesday 7 February 2017 in preparation for our Inter-House Swimming Carnival, with our famous Sync Swim performances, which will take place at Bold Park Swimming Pool on Wednesday 1 March. Hopefully we will be accepted into the Associated & Catholic Colleges (ACC) inter-school competition for 2017. Watch this space for updates! Please note that School bathers will be available from the uniform shop. Lunchtime play is encouraged at Elizabeth Quay every Wednesday and Friday. 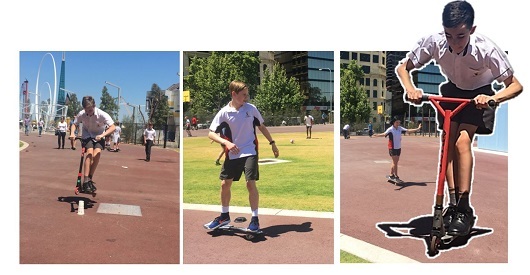 We had a great ‘Skate It’ event where students and staff brought their ripsticks, skateboards and scooters and rode them around Elizabeth Quay. Some students played soccer and basketball while others just brought their lunch to enjoy it outside. This will continue for the rest of this term and into next year. With the strong summer sun we ask that you please ensure students have the School hat for PE and all outside activities. In advance of the fast approaching festive season may I wish everyone a Happy Christmas, I hope you get lots of sports equipment from Santa! What a start to Term 4! On Wednesday 19 October our Chapel Band provided the music for the Anti-Poverty Service at St. George’s Cathedral. This year the focus was on domestic violence (leading to poverty). 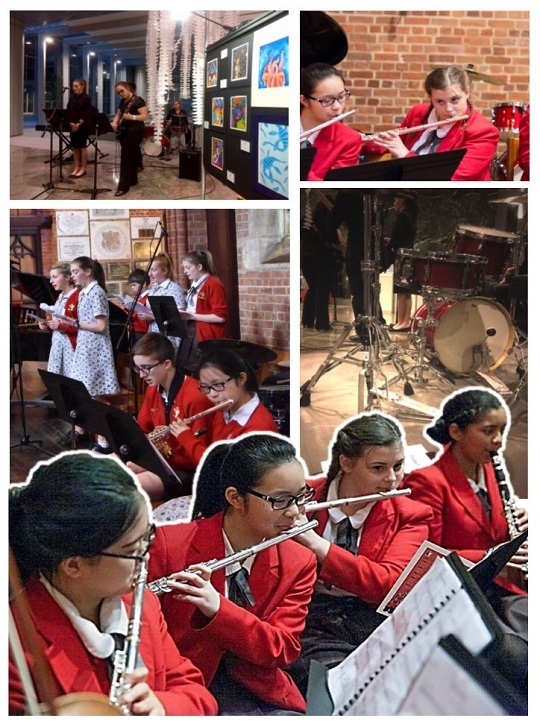 Later that evening our Jazz Ensemble played at the St. George’s Art Exhibition opening at Central Park. The next day Chapel Band were back at the Cathedral for the Year 12 Graduation Chapel, followed by student performances for the Graduation Assembly, and Swing Band at the Graduation Ceremony in the evening. The following week Swing Band and Jazz Ensemble performed at Royal Perth Hospital as part of their ‘On The Bridge’ concert series. A huge thank you to all the musicians who contributed to these various events! This term we have also begun Songwriting and Production Workshops, run by our resident producer Byron Keno. Byron is a professional producer who has worked with a number of large labels such as Sony and EMI. Through his work with those labels he’s produced a number of top South African artists, and has mixed the soundtracks for the movies “Mama Jack”, “Mr Bones 2” and “Running Riot”. In 2010 he mixed the single “Hey You” for Australian Band, The Transients. These workshops are a fantastic opportunity for our students - we are very privileged to be able to access his expertise and knowledge. The West Australian Newspaper recently published a feature in their ‘Health and Medicine’ section titled ‘Top 10 Health Regrets’. Many such as number 1 ‘Failing to Cover Up in the Sun’ and number 3 (Complications from Piercings) were unsurprising. Number 4 caught our attention - Quitting Music Lessons. The article summarised a now considerable (and growing) body of research that demonstrates that musical training is linked to better language and mathematical skills, higher IQ, improved well-being, and overall greater academic achievement. They are all good reasons to learn an instrument (along with evidence WA students who have studied music do better in their ATAR and the fact that playing music and learning an instrument physically alters to brain and strengthens the connections between the left and right hemispheres). However, the main reason is quality of life. Music is a major contributor to a life well-lived, both right now for beginners and into the future as more experienced musicians. Psychologists call the optimal experience derived from playing an instrument ‘flow’. Applications to start learning an instrument in Term 1 2017 are now open. The application form and handbook can be downloaded from the School website. This term the students in Years 7 to 10 have started regular service work, in respect of our motto of “Wisdom, Grace, Service”. The service being to serve others, especially “the least of these my brothers and sisters” (Matthew 25:40). We had a fabulous 2016 Ski Trip where we stayed right up on the mountain in the thick of the snow at Matterhorn Lodge. 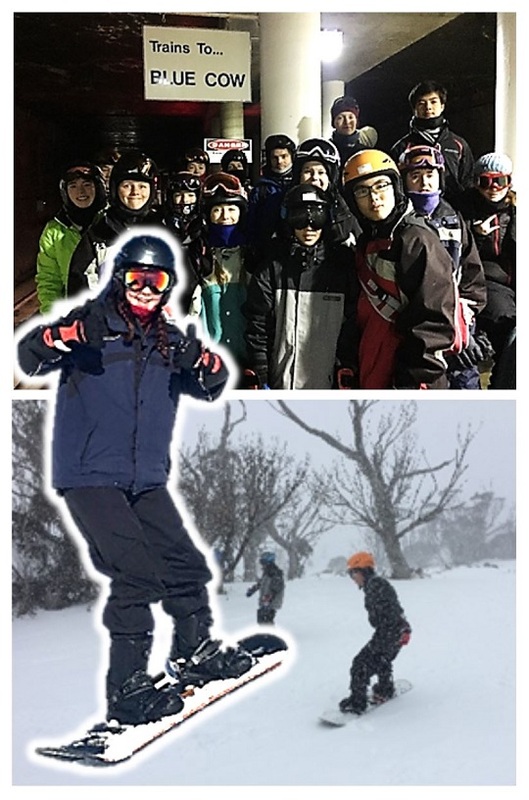 It was so good that we are heading back to Perisher and Canberra next year! The trip will take place in the first week of the July School Holidays from Sunday 2 July to Saturday 8 July 2017. Expression of Interest forms will be circulated this week. Please return them to Ms Jodie Scheele. 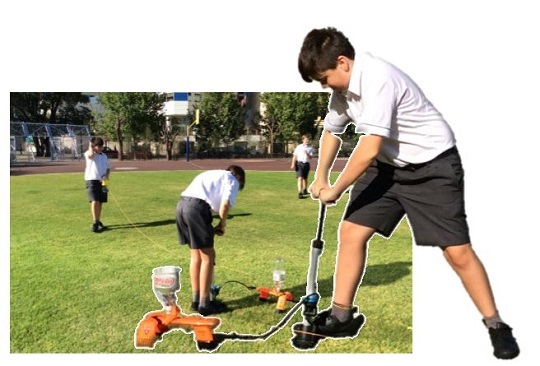 Students had some great fun with launching aquapod rockets during the Rocket Science co-curricular at Elizabeth Quay. Many bemused onlookers and the students were very excited. One priceless moment was when a student managed to catch the ‘rocket’ before it hit the ground. 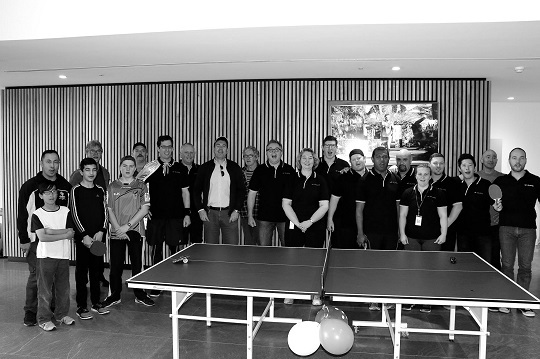 The St George Dragonslayers participated in the Perth City Ping Pong-a-thon recently! The event raised just over $18,200 to fight sexual trafficking and exploitation of children and young people in South East Asia. This money will go towards prevention – for example, keeping children in school; street intervention – providing those forced into the industry a safe haven and at times, a chance to be kids; justice – supporting lawyers who are prosecuting the perpetrators of these hideous crimes; and new futures – helping people who have escaped the industry hope for a brighter life ahead. Well done to the Dragonslayers and hundreds of others across Australia in playing ping pong and raising money.